this simple script will delete it for you. just choose the folder/folders containing the render images it will auto search them and clean those extra unusable elements for you. Warrning: use it on your own risk , and there is no undo for this at all so be carefull and plz send feedback. RenderGuy is Rendering/lighting/fixing tools you can Fix your missing maps ,collect your maps or archive it ,copy paste objects materials lights between different files , mange complex lighting setups with Light detictive ,quick mr studio and quick passes, All in one. IF you do alot of rendering you will need this. Pose Factory is an easy to use Pose Manger for saving loading unlimited number of poses for any custom made characters . -load pose on selection only. -loading on body only or face only . -all custom attributes will be saved. -different kind of saving loading sets so you can have many poses for each character all saved and portable. 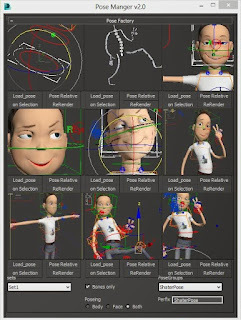 -loading poses from different characters made by same autorig (has same naming structure/prefix), so any rig done by Shater Autoriger or any other autoriger will work just fine. -all poses are portable , you can find it on your animation folder of your project and you can share them with your team. -all the character controllers names should be Charactername_hand, charactername_footIk ..etc , it will work on any set of objects on the layers assigned this way. -in setup panel enter the layers name prefix or change your charcters to match PoseFactory defaults and you are set to go. This tool was used on Shater Autorigger and moody free character rig , its mdified to all rigs or set of objects now. v:2.1 release for all rigs not only Shater Autoriger tool. 2.11 fix local posing (load relative pose) don't work , now you need to change your character main cont. name or modify it from the script setup rollout. Finally Paypal is working for my country .